Sometimes as screenwriters we get lost in the last project we are working on, or all the overwhelming information and advice that’s floating on the web. A few words from Francis Ford Coppola remind us how personal the writing journey is. MoS –As simple as that! MoS –When you bury yourself under screenwriting books, magazines and blogs, you can lose touch with what you are really meant to be doing, aka ‘writing from the heart’, which will ultimately create the movie that captivates audiences. MoS –This great reminder for writer-directors inspired me to do a quick exercise. I thought of the first movies that taught me how crucial writing is and how spellbinding acting can be. They happened to be two movies starring Meryl Streep, whom I adore. When I watched ‘The Bridges of Madison County’ I was blown away by all the long scenes of two characters talking in a little kitchen. I couldn’t get enough of their sweetly tension-filled dialogue. There were no effects, fast paced cuts, nothing noteworthy about cinematography, but I could watch that couple in that kitchen forever! All thanks to Richard LaGravenese’s beautiful screenplay. The movie that popped in my mind for acting was Meryl Streep’s performance in the opening scene of Mike Nichols’s ‘Silkwood’. Streep’s character drives her boyfriend (Kurt Russell) and flatmate (Cher) to the factory where they work. When they get stopped at the gate, Russell leans over the driver’s seat to hand something to the guard. As Russell is leaning over Streep, Streep habitually sniffs Russell. It’s a momentary thing, as it should be; probably not a directorial decision, may be not even an acting decision. But that moment of intuitive acting unintentionally helps form a clear picture of what this couple is like together. Beautiful example of how acting can capture in an instant what writing or directing cannot. Coppola “In terms of money, I have a magic box. I do. In that box is an infinite amount of money. So when I have a worthy project I just go in that box and I take out the money. The box doesn’t exist and therefore there’s nothing in it. But I believe there is. And ultimately that’s what happens. MoS –Never underestimate the power of manifestation. Use your imagination, and not just in the writing process. MoS –I get criticized for doing this, because even the finished screenplay ends up a little novel-like. But I believe in delivering all the feeling I can in description so the screenplay plays as a movie in the reader’s mind first. MoS –Since no one really knows you might as well go with your gut-feeling. But make that gut-feeling as well-informed as you can. MoS –This is in the same vein as Viki King’s model of screenwriting. If you haven’t already done so, I highly recommend you read ‘How to Write a Movie in 21 Days’. 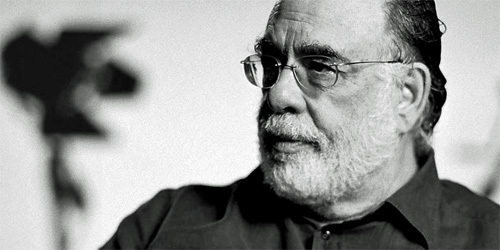 – Extracts from ‘The Rumpus Interview with Francis Ford Coppola’ by Anisse Gross. August 17, 2012. View the full article at The Rumpus.